I've had to restrict my time on Pinterest because like so many other inspirational websites, this one can consume HOURS of my time without me realizing it. However, the flip side to that is that I come across fantastic ideas! The papercrafting ideas are limitless. Some are over the top and some are more subtle. My card today is a case (copy and share everything) from Pinterest on the more subtle side. I loved the clean, simple look of this card. This was made for my friend and demonstrator, Cassandra. I typically like a lot of embellishments and layers, but I was drawn to the simplicity of this. The white on white with just a touch of color is always a classy look. 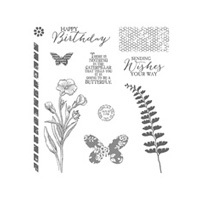 The flower image is from the beautiful Summer Silhouettes stamp set and the sentiment is from Bring on the Cake, a huge 13 piece word set dedicated especially for birthdays. Between these two sets, endless birthday cards can be made. Like the splash of color? That's Raspberry Ripple, a new In Color. SO pretty! Isn't this fantastic? I LOVE it! Like the products you see here? Visit my online store...and don't forget the Clearance Rack! A friend of ours had a birthday in late August and I needed to come up with a masculine card. My go-to favorite set for men is The Open Sea. This set originally made its debut in a mini catalog last year and I was so relieved to see it available in the main catalog in July. The details in the images are incredible. Marina Mist card stock was a perfect choice for my nautical card - even the name goes along with it nicely! Paired with Basic Black and Crumb Cake, the image really pops off the card. I colored the image using Blender Pens and coordinating ink pads. Do you need the perfect masculine stamp set too? The Open Sea: 123030 W - $26.95, 123032 C - $18.95 Shop my online store to get this stamp set! Another birthday has come and gone but I have some wonderful cards to treasure long after! The card I am featuring today came from my good friend and fellow demonstrator, Linda Goldhersz. Linda and I, along with four other friends/demonstrators, volunteered at the Ronald McDonald House in Orlando as part of Stampin' Up! 's Making a Difference program. I am so grateful to have Linda in my circle of friends...and she makes beautiful cards too! 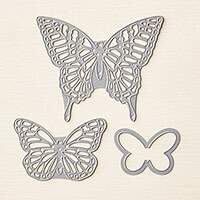 She used the Betsys Blossom stamp set, a new set released in the 2012-2013 Stampin' Up! catalog. The colors on this card are awesome! Early Espresso, Cajun Craze, Baja Breeze and the new In Color, Summer Starfruit - they work so well together. I am definitely going to try this color palette on a card myself. Check out my On-line store to get your Betsy's Blossom's stamp set today! Today is my birthday and as a result, have received some lovely cards and gifts. This unexpected beauty came from my brother and sister-in-law. I know flowers are so expensive to send and I have frequently told my husband not to send them for the mere fact that the money could be better spent. But, I have to be honest, when these arrived on my doorstep, I felt so special! This was a perfect opportunity for me to create a thank you card using product from the Holiday catalog. I'm really drawn to the Perfectly Preserved stamp set and the coordinating Orchard Harvest designer series paper. I love the colors in this new paper! And, the striped and cross-stitched piece is my favorite. I used a number of accessories to add interest to this card including the Cannery set framelits (#127822), Adorning Accents edgelits (#125595) and the dotted scallop ribbon border punch (#119275). I also added an additional sentiment from the Sweet Essentials stamp set. So, I am off to enjoy my day with a friend for lunch and then a wonderful Mexican dinner with my husband and daughter. I will be back in the craft room first thing on Thursday getting ready for my Blooming with Kindness card class in Clermont Thursday night. I can't wait! I'm really enjoying the new stamp set, Betsy's Blossom. With so many different images available, it's easy to make completely different projects every time you ink a stamp. Today's project didn't turn out exactly how I intended it to and at one point I was pretty frustrated that my vision wasn't coming to fruition. Then last weekend I had a couple of stamping friends over and they commented how much they liked it. Really? They insisted that they did. It just so happens that one of those friends had a birthday yesterday, so guess what? She got this card! So whether she really liked it or not, it ended up in her mailbox! The technique I used is called emerging color. This is a technique that highlights the colors or images underneath a stamped image that is embossed in clear embossing powder. After embossing, you brayer color over the entire card and those areas that were not embossed are essentially hidden. When the excess color is removed from the clear embossed images, the colors or images "emerge" from behind. The images that are "emerging" is the new designer series paper called Comfort Cafe (#126898). I really love the warm colors in this paper pack. Pretty anytime of the year, but I can see really enjoying this in the Fall. So, happy birthday to my friend, Carolyn! I hope you enjoyed your day AND your birthday card too! Ready to shop the new catalog? Click here to see all great new products!